The "RSX on RSX" indicator feeds the output of RSX on price to another RSX and plots the result. 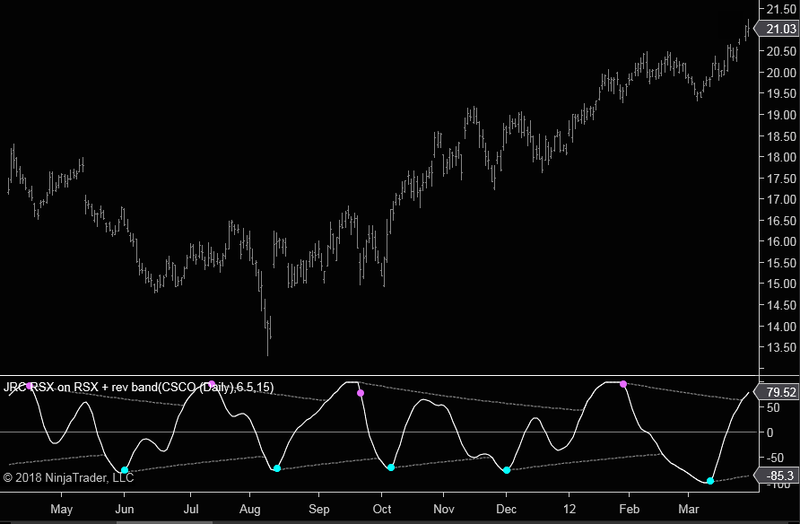 Standard RSX analyzes trend strength, but RSX-on-RSX analyzes trend acceleration. This synchronizes RSX with rapid market reversals, typically found in a tight trading range. This particular indicator places an exponentially contracting band around the RSX-on-RSX oscillator. The indicator displays a colored dot each time the oscillator separates from the band. Good for designating buy/sell opportunities. For more information about RSX, go here.